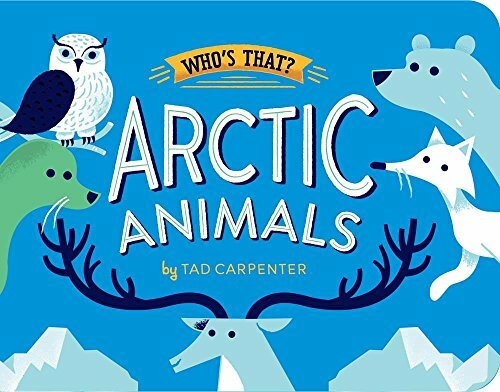 I love exploring arctic animals in the winter. 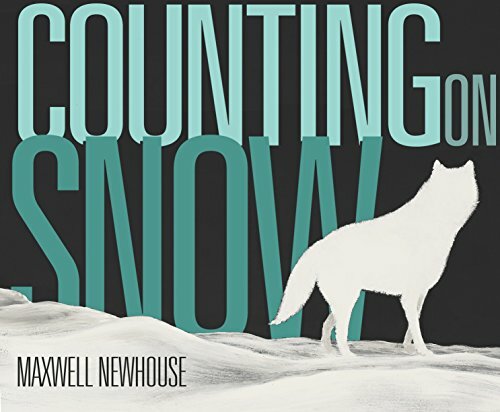 It is interesting to see how we get so cold in the snow, but arctic animals are created to withstand the freezing temperatures. 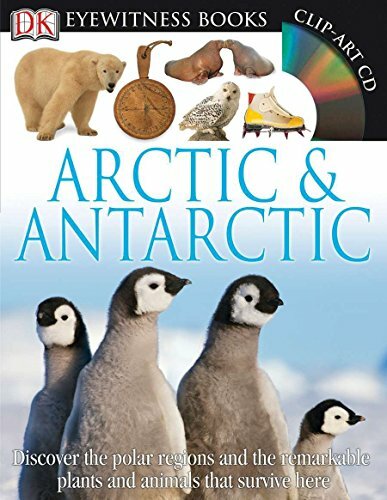 It is so interesting to me to learn about these animals, especially when it is winter outside for us too. 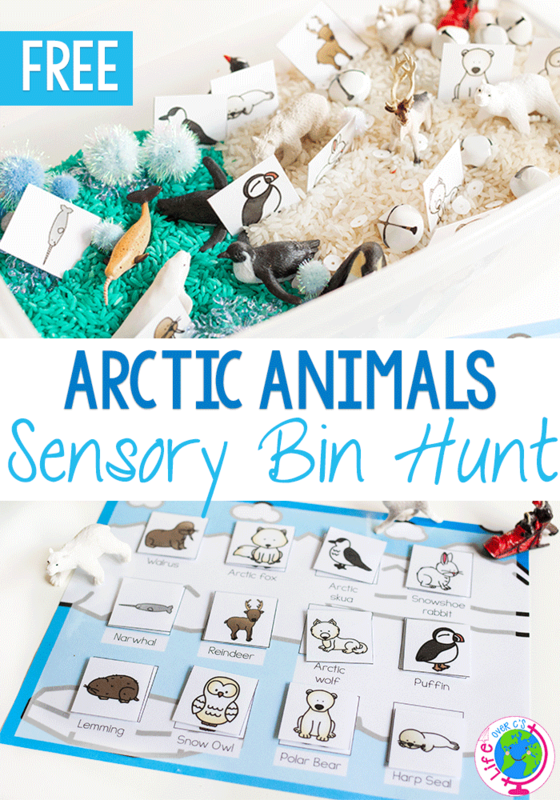 I created this Arctic Animal sensory Bin Matching Game so that we can not only explore the animals but have a fun matching game with a sensory aspect. 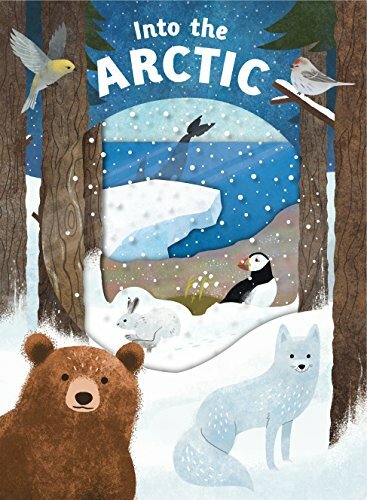 It is so fun my kids can’t put it down! 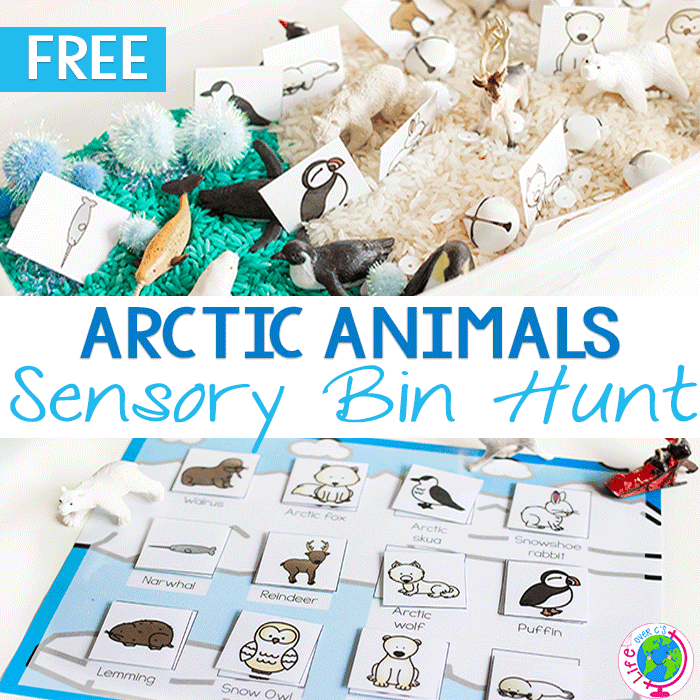 Fill your plastic bin with the sensory bin filler of your choice. We like to use rice but there is plenty of other fillers that can resemble snow and ice. 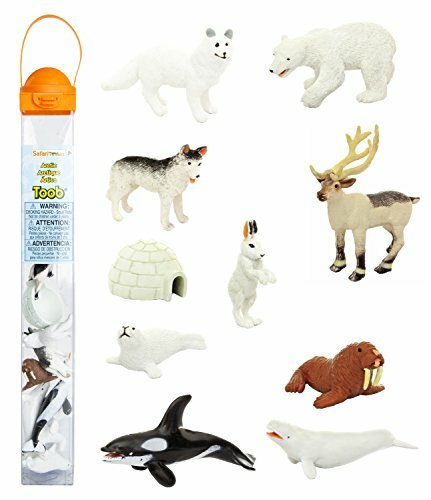 We like to stick the arctic animal figurines into the filler too. 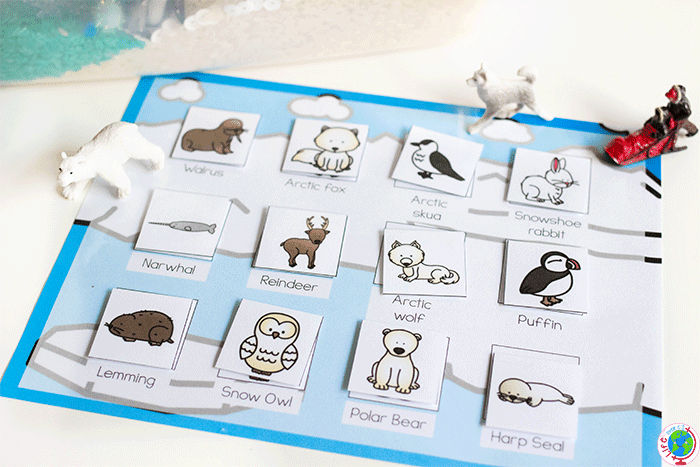 Print out the matching game. There is two parts. 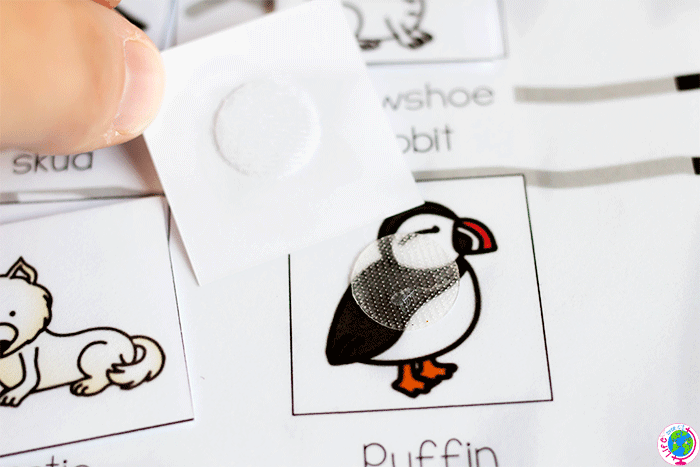 The first are the squares that you will cut out, laminate and put into the sensory bin. The second is the ‘recording sheet’. This is where the match is made and stays until the game is over. I like to laminate each section of the game. This will preserve the life of the game to be played over and over. I prefer to cut the game pieces out and then laminate and cut again. I also like to laminate the recording sheet too. One thing that is optional but I like to do is take velcro dots to the back of the matching pieces as well as each space/object on the recording sheet. This will help kids place the match where it belongs without the pieces going crazy. Bonus: Velcro is awesome for building fine-motor strength! The next thing I do is toss in all (or some, depending on the child) of the matching pieces into the sensory bin. Mix it up really well. Make sure some are on the bottom, in the middle and then again on top. Have the child grab one card and match it to the recording sheet. Once all of the matching pieces are found and matched, the game is ‘over’. 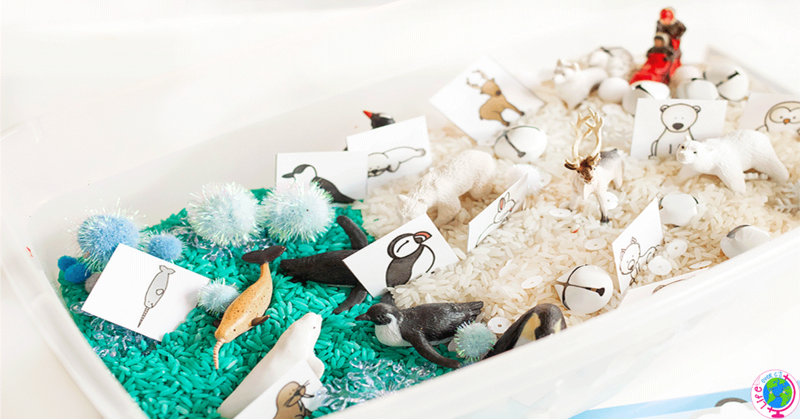 Chances are, though, that children will want to play in this sensory bin more. 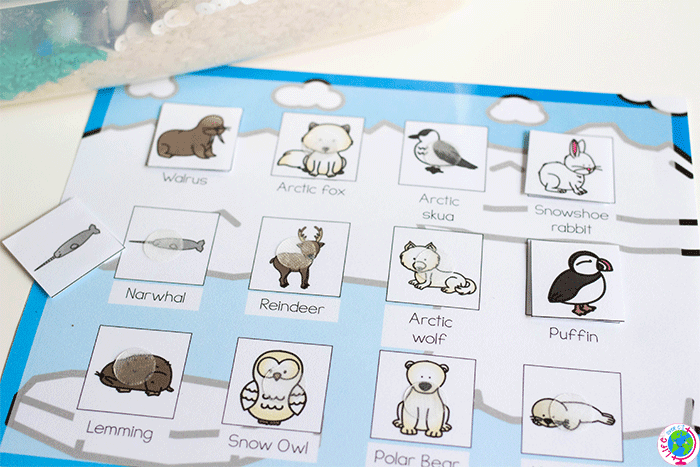 Instead of just having the child match the card to the correct space, ask the child to state what the animal is, possibly give facts about the animal, ask how to spell the animal’s name. The cards can be play objects for pretend play. Yes, they are part of a matching game but that doesn’t mean kids can’t use them as pawns in a movie theater. 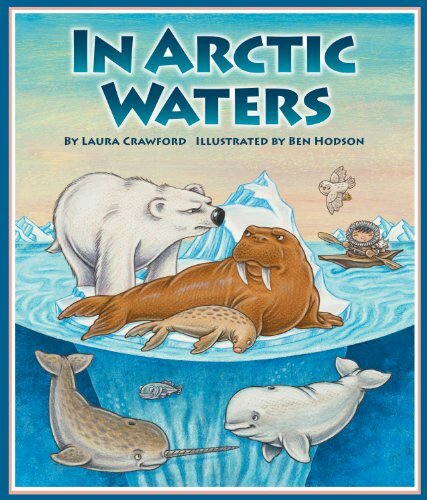 Or grab some of our favorite books about the Arctic and play I Spy to identify the animals in the book. At the end of the post there is a long horizontal picture that says “Get Your Printable Here”. If you click this, it will take you through the download process.